Link to Vegan Twix Bars recipe. GV comments: These don't win any nutrition contests, but they taste way better than industrial Twix Bars! They're also more substantial and satisfying, meaning you can stop after one bar (well, maybe one in the morning, one in the afternoon and one in the evening). Like the Raw Snickers Slab, these bars will delight all the dessert-lovers in your house, or at a picnic or potluck. If you're not concerned about the bars being gluten-free, you can substitute regular (vegan) sugar for the coconut sugar and whole wheat pastry flour for the coconut flour. Timing: About 90 minutes from start to eating. Link to Chocolate Infinity Pie recipe. GV comments: This phenomenal recipe could become a staple in your repertoire. It comes out perfect every time--no trickiness here. And it's relatively healthy. There's a package of tofu in the filling, but none of my guests have yet guessed it. The divine crust and creamy chocolate texture of the filling win people over. Frankly, they don't care what's in it. Timing: Over 2 hours, but that's only because it needs to be chilled for 6 hours to firm up. The active preparation takes less than 30 minutes. Nutrition: Healthier than most pies... The chocolate chips and maple syrup are the only processed foods. Link to Nibby Buckwheat Butter Cookies recipe. GV comments: I once had a whole wheat version of this type of cookie, called a Whole Wheat Sable (the LA Times appears to have landed permission to reprint this recipe here). When I volunteered to lead a workshop on buckwheat, I wondered if there was possibly a buckwheat version of it, and, lo and behold, there is! By the same pastry chef, Alice Medrich. I adore the buckwheat version, because it has a kind of sandy texture in your mouth. It's not sweet like chocolate chip cookies--it's much more subtle. You will keep eating them to figure out why you like them so much. Vegan butter works very well with these. Timing: Over 2 hours (because you have to chill the dough). Active time is less than 15 minutes to make the dough and shape it into a log, and a few minutes here and there to cut and bake the cookies. Link to Cookie Dough Truffles Vegan Gluten-Free recipe. GV comments: My sister made these on my birthday this year. All I can say is "WOW"! All the omnivores loved them, too. They're not super healthy, but they have much less fat than regular truffles. I recommend them highly! 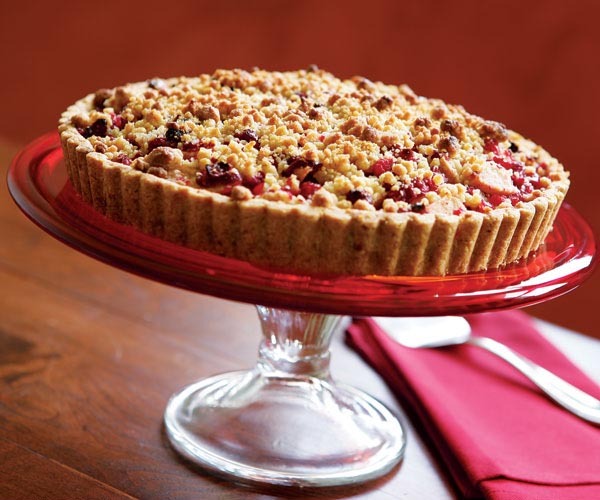 Link to Festive Cranberry-Pear Tart in a Walnut Shortbread Crust recipe. GV comments: This tart is a favorite whenever I make it. It looks gorgeous, bursts with the flavors you crave in the autumn, and is quite forgiving -- the crust is pushed into place rather than rolled, the fruit is not uniformly sliced and arranged, and the streusel top is much easier than a top crust. I use vegan butter instead of dairy butter, and instead of an egg yolk and half-and-half I use non-dairy creamer or milk. It works perfectly -- easy to veganize. It takes some time, but it's worth it for a special meal. Link to Raw Snickers Slab recipe. GV comments: Wow, I never thought I'd taste a Snickers bar again, but this is very close and, in my opinion, BETTER than a real Snickers bar. This is more wholesome, even as it captures that caramel-nougat-peanut combination that screams "Snickers!" You'd never guess that the ingredients are mostly super-healthy: oats, maple syrup, dates, almonds. You'll have to brush off your metric-conversion skills, since this recipe is from the UK, but it's worth it. Oregon and Washington are "blessed" with an invasive wild blackberry whose informal name is the Himalayan blackberry, although it evidently is native to Western Europe and was brought here in the late 19th century. The thorns are unbelievably large and sharp, but the berries bake up like regular blackberries...and the price is right! You can find them everywhere. I adapted my fruit crisp recipe especially for these berries -- this one is low in added fat and a definite winner. Pour these over the mixture and stir them in with a spoon or your hand until you get uniform crumbs. Link to Healthy Chocolate Pecan Pie. GV comment: This is another one of those "there's a carton of silken tofu in this" miracles. Quite ingenious and delicious. I made this for a family event (mostly omnivores) without a crust (because several people were on a low-carb diet), and it was a hit. Of course I topped it with whipped sweetened coconut cream for the slam dunk. GV comments: I thought I would never taste carrot cake again after giving up eggs and dairy, but this brought me back from deprivation. It’s as good as my old recipe, if not better. Everyone loves this cake. I must say, though, that I don't like commercial vegan cream cheese, so I don't make the cream cheese frosting in this recipe. I recommend Easy Cream Cheese Frosting. GV comments: You and your guests or family will be surprised at the unexpected ingredient—in fact, I wouldn’t tell them there’s tofu here—just call it Chocolate Mousse and leave it at that. See if anyone asks questions. It can be your secret. I know I promised only recipes without strange ingredients, but no one will taste this one. It’s delicious and easy. GV comments: These decadent delights will wow your guests and family. No one will notice the absence of butter or cow’s milk. Just sit back and watch these morsels fly off the plate--use the prettiest plate you have. You get big bang for your buck with this recipe. These are nice for a dinner party when you just want a small dessert at the end. GV comments: No one will miss butter or eggs with these biscotti. They are super tasty, and the combination of hazelnuts and chocolate is irresistible. You will get accolades with these. You could dip one end of each in melted chocolate and let them cool for an elegant touch. I highly recommend the cookbook Veganomicon, from which this recipe comes. GV comments: The combination of chocolate and oats is a "Wow!" with this cookie. Then add a hint of coffee. It makes for sublime chewy, textured, mocha goodness. This is a must-try. Fruit crisp is successful in so many different ways: I couldn’t pin down just one favorite recipe for this one. I’ve presented a number of mix-and-match alternatives—choose one topping and one filling. Try them all! In a medium bowl, combine almond flour and sea salt. In a small bowl, combine oil and agave. Stir wet ingredients into dry and set aside. Use a pastry cutter to cut in. Set aside at this point or after stirring in the optional add-in. Place all these together in a large bowl; toss together until fruit is coated. Place mixture in an 8×8-inch glass or ceramic baking dish or equivalent size. Sprinkle topping over fruit. 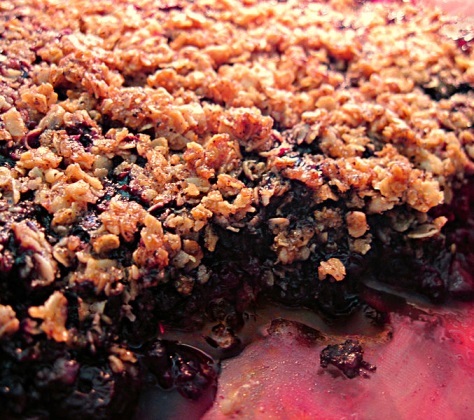 Bake for 45–60 minutes (for pear-cranberry version, cover for first 45 minutes), until fruit is soft and bubbling and topping is lightly browned. The recipe for this lovely and very reliable apple cake is adapted from Gourmet magazine. My friend Jo found the recipe, and another friend, Patty, veganized it. It doesn’t need frosting, but you could dust it with powdered sugar, top it with an apple or cinnamon glaze, or—my favorite—top it with a dollop of whipped coconut cream. Preheat oven to 350⁰. Use cooking spray to coat 12-cup bundt or tube pan. Wipe off excess with paper towel. Gently flour if your pan needs it. Fold the flour mixture and the egg replacements into the wet ingredients until just combined. Fold in apples and raisins and spoon into the pan. Even out the batter. Bake in the middle of the oven until a tester comes out clean. Check after 55 minutes, but it may take up to 75 minutes. Cool in pan or rack for 10 minutes, then turn out on a rack to cool completely.